One of the most striking buildings on the Barangaroo waterfront, Sydney’s newest CBD precinct, has hit the market with a price guide of about $35 million, reports the AFR. The divestment is part of Lendlease’s ongoing strategy to develop the assets then sell them and use the funds for other projects. 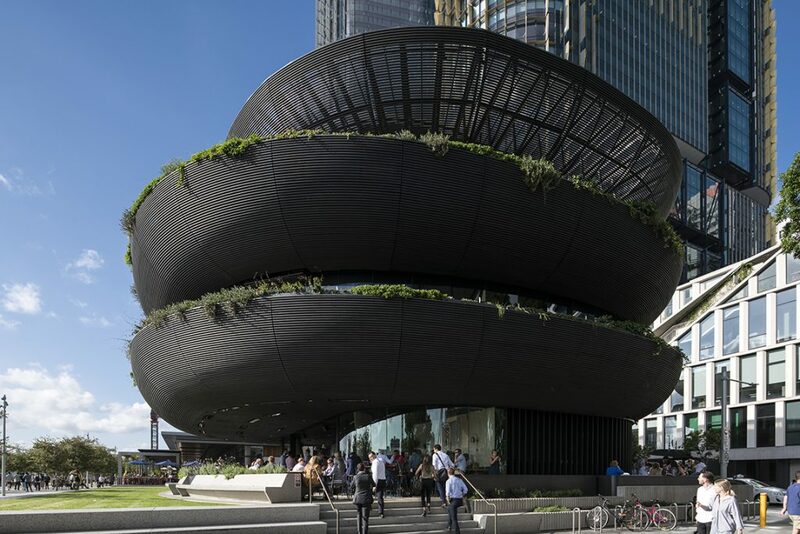 The three-storey circular Barangaroo House, which resembles a bird’s nest with its timber facade curving in three dimensions, extensive green canopy, and mix of indoor and outdoor spaces, was developed by Lendlease following a design competition in 2013. It is leased in its entirety to long-term tenant Solotel, owned by celebrity chef Matt Moran and Bruce Solomon. CBRE director James Parry, who has been engaged to sell the building, said it was a “trophy asset” ideally suited to high net worth individuals, both locally and internationally. Last year, Lendlease sold a 10 per cent stake in its $2.6 billion Tower One at Barangaroo South, which it developed in 2015, and the developer now holds only a 2.5 per cent interest in the building. In February this year, the global infrastructure and development giant reported a 96.3 per cent drop in first-half profit, hurt by the continued underperformance of its local engineering and services businesses. The construction group also faces headwinds from a drop in building approvals owing to a steep decline in the domestic real estate market. Following the profit announcement, Chief executive Steve McCann flagged the potential sale of non-core businesses. Meanwhile, the Barangaroo South precinct is on track to become one of the highest trading CBD locations in Australia with the precinct already achieving its 2021 forecasts, The Sydney Morning Herald reports. Once complete, the precinct will be home to more than 23,000 workers and residents.